For instance, there suddenly came to me a strange consideration, that if I had once lived on the moon or on Mars, and had committed some most shameful and dishonorable act there, such as can only be imagined, and had been abused and dishonored for it as one can only perhaps feel and imagine in a dream, a nightmare, and if, ending up later on earth, I continued to preserve an awareness of what I had done on the other planet, and knew at the same time that I would never ever return there, then, looking from the earth to the moon—would it make any difference to me, or not? Would I feel shame for the act, or not? I gave you a new name after we fought. A name I used every time I talked about you. Then we saw once. Accidentally, I must say. Saying a Hello might stir up dust again. We consciously avoided facing each other. I don't know what was between us before. I don't know what is between us now. I can't call you that name anymore. Right click on the tab bar and choose Task Manager. Or press Shift+Esc. 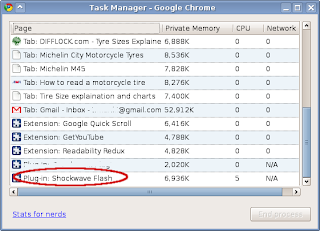 Select the item Plugin: Shockwave Flash. You will have to refresh Gmail and any other frozen web pages. If you see a yellow banner saying "The following plugin crashed" on any tab, refresh the tab, and the tab will reconnect with the crashed plugin. When you're pissed off with someone, ask yourself if you have paused your life. Resuming life is almost always the solution that's both good for you and your relationship with the other person. Update (Jan 4, 2010 5.35pm): Similar to pausing the life when something "bad" happens, we might pause the life when something "good" happens too. However good it might feel to pause life when you feel nice, it's almost always good to move on. Live your life -- don't stop, and don't pause.